A resident said van break-ins are ‘rife’ in Sussex and are ‘destroying people’s lives’. Peter Stevenson, 57, of Vale Road, Haywards Heath, said he wants other people to be aware of the ‘epidemic in the area’. He said: “There has been a series of break-ins to tradesmen’s vans in Sussex and it is an organised crime epidemic. “I have seen how rife it is and stolen tools are being sold on Facebook, at car boot sales and on eBay. “It is happening due to the lack of police. My father was an old-school police officer, so that is why I care about it. Police have not got the resources to deal with it now. “One van is broken into every 23 minutes in this country. Ford vans can be opened in seconds with a skeleton key available openly on the internet. It’s costing the economy between £50-£100 million each year. “Tradesmen are being targeted on building sites, builders merchants car parks, on customers driveways during the day and at night at their homes. “And it happens more than once – as the thieves know people will have had to replace the tools with new ones. But the police do not have the manpower to investigate even if you find your tools being sold online. “It is destroying lives and is becoming a war, there have been demonstrations about it across the country. Mr Stevenson, a bedroom, home and office fitter, who drives a van, was a victim of theft 15 years ago and said the law ‘needs to change’ to prevent further thefts. “If it was made harder for people to sell second-hand tools, like having to show proof of ownership, that would help,” he said. 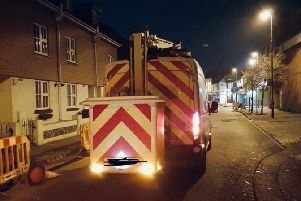 Simon Hancock, owner of plumbing business SA Hancock Ltd in Ansty, Haywards Heath, said one of his vans was broken into last Tuesday. “Five or six vans were targeted in Haywards Heath and Cuckfield that night,” he said. Sussex Police said it has been made aware of the thefts and ‘enquiries were ongoing’. A spokesman added: "Van owners are asked to ensure that valuables and expensive tools are removed from vehicles overnight and owners should consider fitting steering locks or alarms. "Vehicles should be fully secured at all times, even if left for only a brief period, and any theft of number plates should be reported to the police without delay." - Don't leave the engine running while defrosting a vehicle. Not only is this illegal but it offers a golden opportunity for thieves. - Don't leave coats and jackets on show. - Remove sat nav and camera suction marks from windscreens, they are an immediate giveaway that such devices may be in the vehicle. - Remove the contents of glove-boxes and leave them open to show that they don't contain anything valuable. - As well as removing tools, display a sign indicating that they are not stored inside the vehicle. -Anyone with information about thefts of or from vans is asked to report online, email 101@sussex.pnn.police.uk or phone 101. Alternatively details can be passed anonymously via the independent charity Crimestoppers on 0800 555 111 (www.crimestoppers-uk.org). If a crime is in progress, always dial 999.